Each year, Mexico plays host to millions of Monarch butterflies that come from Canada in search of the forests full of fir trees in Michoacan and Mexico State. Each year, Mexico plays host to millions of Monarch butterflies that come from Canada in search of the forests full of fir trees in Michoacan and Mexico State.It's fascinating to learn that the Monarch butterfly, a fragile insect weighing just one gram, can actually fly over 3,000 miles from Canada to Mexico in about 33 days, the equivalent of roughly 90 miles a day. More surprising is the fact that the average butterfly's life span is about three weeks, whereas the Monarch butterfly can live for up to nine months. Scientific data suggests that this migration to Mexico occurs because the weather is ideal for mating. Nearly 9,000 feet above sea level, the fir forests in Michoacan and Mexico State attract literally millions of colorful butterflies each winter.The survival of the Monarch butterfly depends on the fragile ecosystems of the forests, and also the respect of humans, while they are in their clusters of chrysalises, hanging from the tree tops all the way down to the ground. 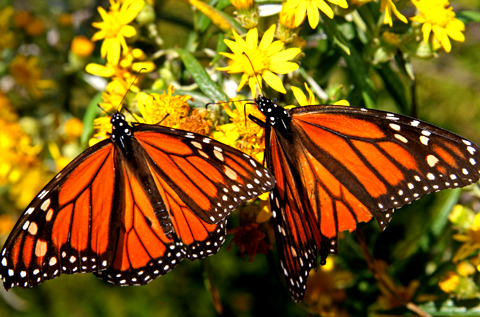 In 1974, the first colony of hibernating Monarch butterflies was found, and from that moment on the state government took action to make sure that all the places where they mate or hibernate were protected zones. Nowadays, there are seven sanctuaries for the Monarch butterflies, four of which are in Ocampo, Angangueo, Zitacuaro and Contepec, in the state ofMichoacan. The three other sanctuaries are located in Mexico State, in the municipalities of Donato Guerra, Villa de Allende and Temascalingo. When visiting the picturesque city of Valle de Bravo, besides enjoying the many outdoor activities available in this beautiful spot, you should also consider taking a trip to the Monarch butterfly sanctuaries. They are located in a huge biosphere reserve that encompasses Donato Guerra, Villa de Allende and Temascalcingo. During the winter months, this 18,000-acre reserve comes alive with the orange and black of thousands of Monarch butterflies. You can see these delicate insects in the tree tops and flitting through the blue sky. Angangueo is a quaint mining town, in the state of Michoacan, where the main attraction is its proximity to theMonarch butterfly sanctuary. Since October 1986, this territory has been protected in order to assist the survival of the Monarchs. This 40,000-acre nature reserve includes the sanctuary at Chincua, where there are also lots of other spectacular attractions, such as a 33 ft. high waterfall at El Salto and the Monarch Study Center. Within the limits of this nature reserve, you'll find the sanctuaries of Cerro del Campanario and Cerro Pelon, where the forests feature both pine and fir trees.The Monarch Butterflies begin to arrive at the forests at the beginning of November, and stay until the end of March, when they spread their wings and fly back to Canada. Due to the fact that Mexico has been chosen by nature as the temporary home for millions of Monarch butterflies, the idea of visiting these places, where you can protect, study, and better understand these beautiful insects, is fascinating. If you visit the butterfly sanctuaries in Michoacan and Mexico State, from November through to March, you'll get to witness one of the most captivating and enigmatic natural spectacles on the planet.